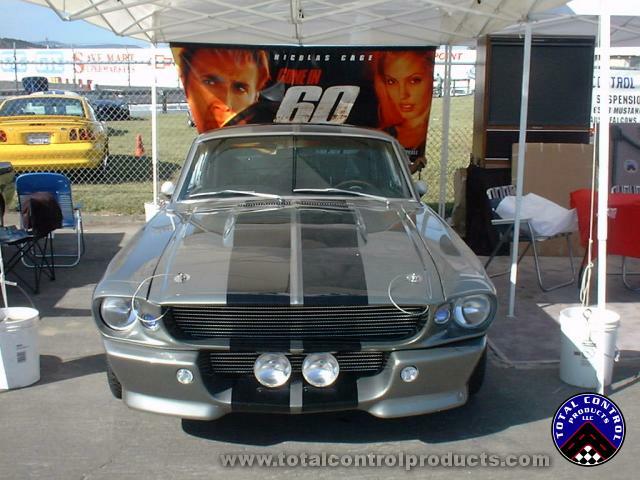 Where's the best place on the Net to find pictures of the Gone In Sixty Seconds car? Right here, at Total Control Products. 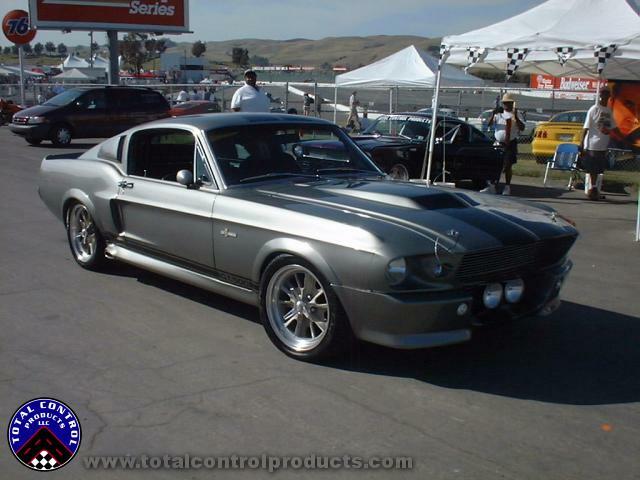 Otherwise known as Eleanor, this 1967 GT500 clone, is definitely a work of art. 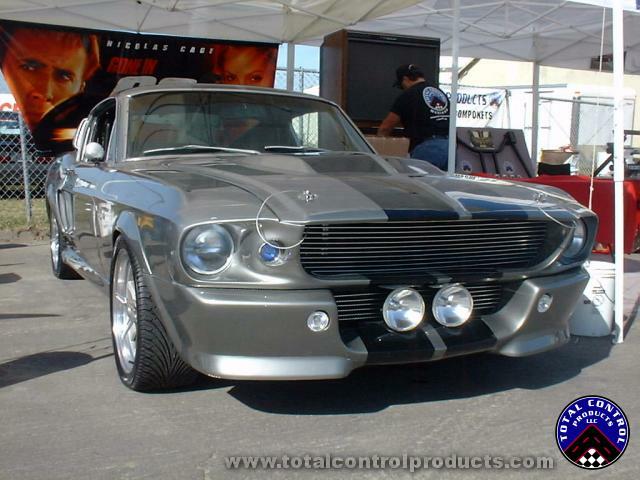 In addition to the custom body work and excellent paint scheme, Eleanor made great use of our Rack & Pinion and Coilover Conversion kits. Just check out the chase scene in the movie. Click on each of the images for a better view. Feel free to copy these images to your hard drive or share with your friends. 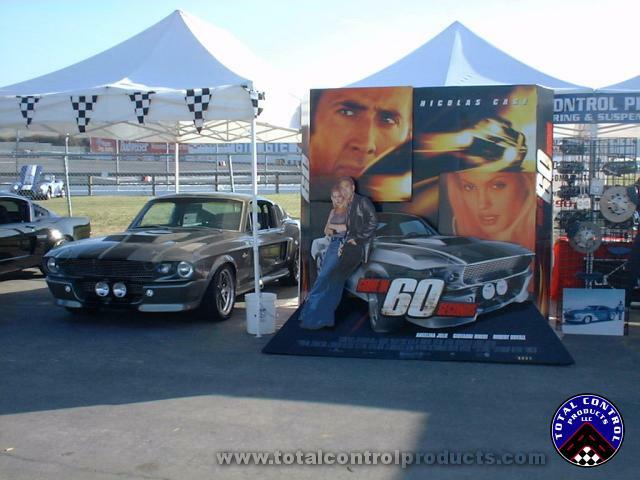 This is Eleanor in our booth at the Wine Country Classic 2000 at Sears Point Raceway. Hood scoop has been molded closed. Fog lamps have been moved down. Custom upper and lower grills. Headlight bezels modified by adding and molded in driving lamps. Fiberglass racing apron with molded spoiler. Maier Racing has a 67-68 Racing Apron with Molded Spoiler in their product line that is slightly different. Possibly modified for Eleanor. 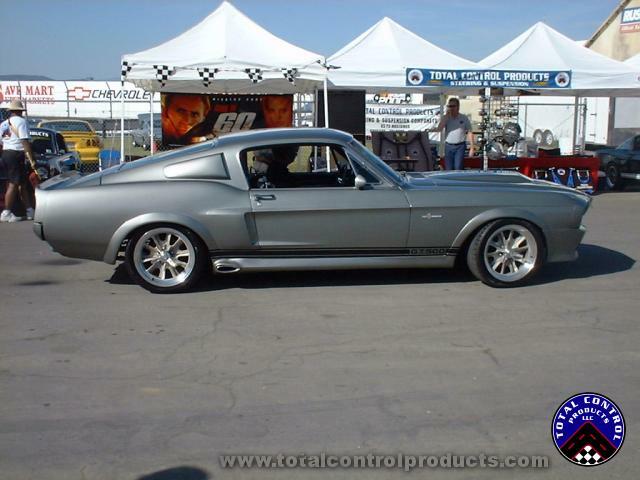 The 17" PS Engineering wheels give a vintage element to a very modern looking classic. Custom fender flares. 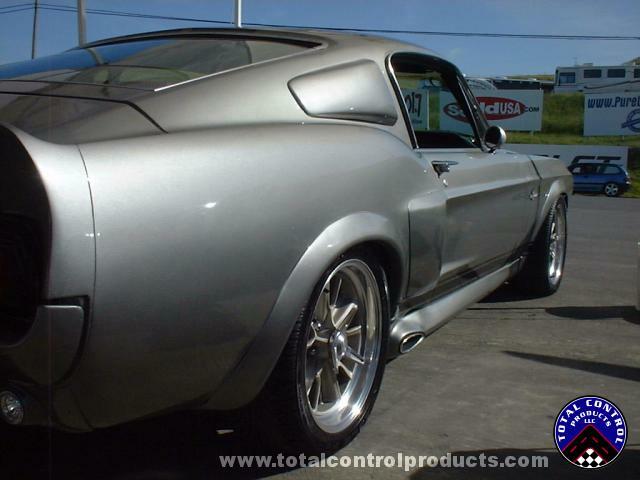 We believe they started with some flares from California Mustang. 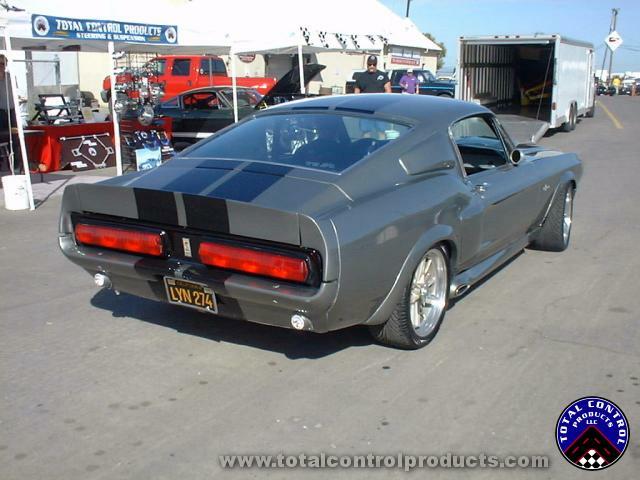 The rear bumper is fiberglass can can be found at Unlimited Performance Products. The rear fuel filler has been shaved and relocated to the driver's side rear pillar. 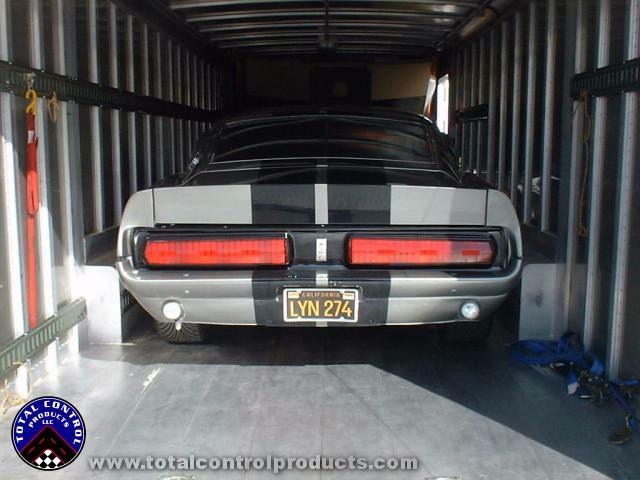 Well this is the last we saw of her as she was loaded onto the trailer for her trip back to Southern CA. We definitely enjoyed her visit and enjoyed sharing her with the the public even more. The components mentioned above are not direct bolt-ons for early model Mustangs. 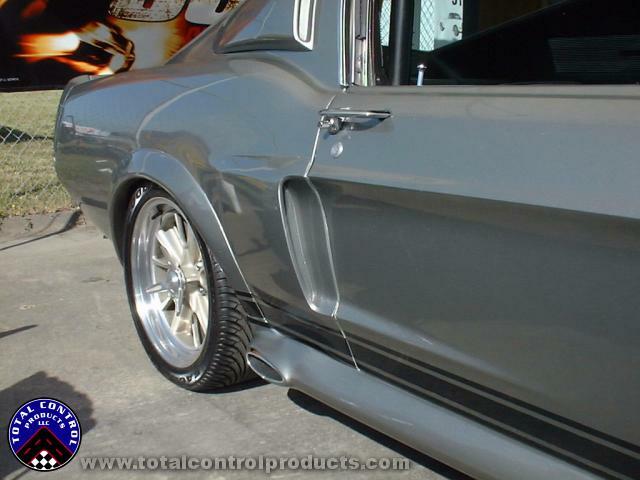 Professional custom modifications were performed on these parts to achieve these results. Through internet research and word of mouth these are the components we have found that closest match the end results. These sources of parts for "Eleanor" have not been officially confirmed.